Public Bath No. 7 (aka Brooklyn Lyceum) at 4th Avenue and Presidents Street in Park Slope was built as part of an almost forgotten progressive movement to improve the quality of life for the poor. Progressive reformers hoped that providing baths would improve the health, social status and upward mobility of the financially disadvantaged. Prior to tenement laws which required bathroom facilities in every flat, many of the urban poor had few bathing options. So, like other public baths constructed during the progressive era, Public Bath No. 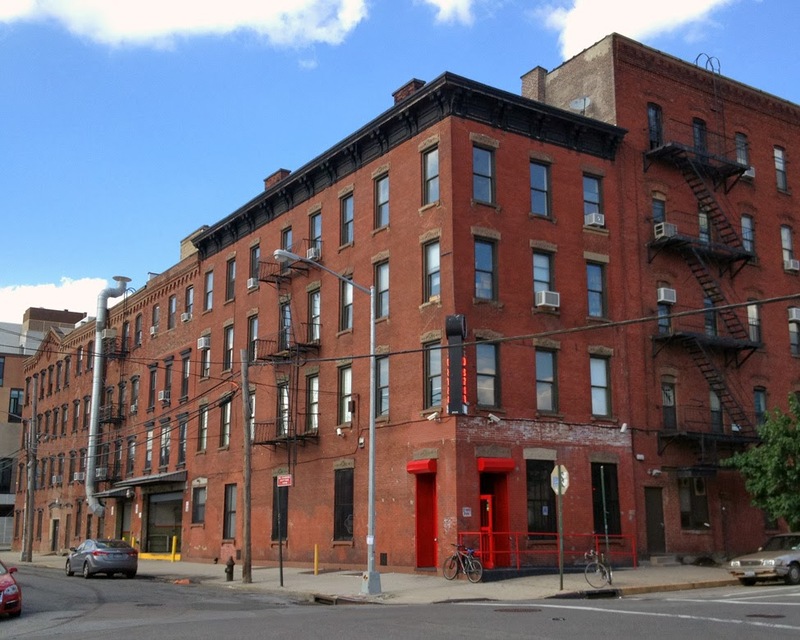 7 was built to provide a place for local tenement dwellers to bathe. Public Bath No. 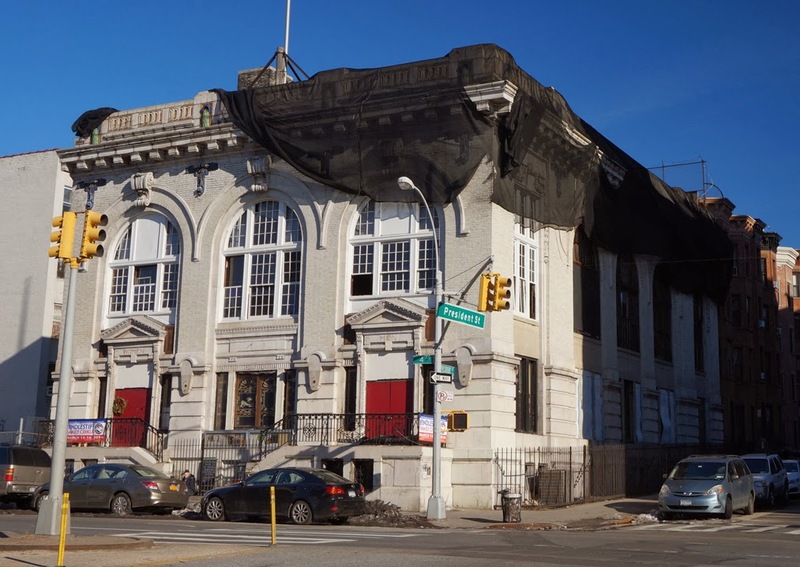 7 was the last of seven public baths to be built in Brooklyn and is one of only three surviving bathhouses in the borough. Designed in the Neo-Renaisance style by Raymond F. Almirall (1869-1939), the bath opened in 1910 and was Brooklyn's largest and most ornate municipal bathing facility. Almirall was a Brooklyn architect educated at the Brooklyn Polytechnic Institute, Cornell and Ecole des Beaux-Arts and designed four Brooklyn libraries (Bushwick, Eastern Parkway, Pacific and Prospect) sponsored by Andrew Carnegie. The Neo-Renaisance style of the bathhouse was based on precedents set by the "People's Bath" in Manhattan, as well as design recommendations from the Association for Improving the Condition of the Poor (AICP) architects Cady, Berg & See. The AICP's aesthetic recommendations included a design vernacular based on Roman architecture; facades were to be “imposing in appearance with an architectural style recalling ancient Roman public baths with classical pilasters, columns, arches and cornices”. With its roots in the City Beautiful Movement, the goal of the architectural plans and detailing was to impart a sense of importance related to bathing by associating the bathhouses with other important civic structures like libraries, banks and courthouses. The layout of the bath included a swimming pool and laundry in the basement; on the first floor was the central office with men's and women's waiting rooms flanking either side, an atrium overlooking the pool behind the office, as well as bathing facilities that included 30 showers for women, 41 showers for men and 9 tubs. In the late 1930s Brooklyn's public baths were renovated by the WPA. Renovation work included "new marble enclosures and copper mesh screening to replace the original soapstone stalls, setting of non-slip ceramic tile, construction of terra cotta and block partitions, shelves, granite steps, and hung cement plaster ceilings and walls". In addition to its architectural association with Roman baths, the building's facade design included ornament that alluded to its purpose. The bathhouse is built of stone, brick and terra cotta with aqueous themed ornamental detailing on the facade. Green terra cotta water spills from a blue drainage spout and below the cornice and in-line with the spout is a terra cotta sculpture of Triton wrapped around Poseidon's trident. Public Bath No. 7 has been repurposed a few times since it closed in 1937. In the 1940s the bathhouse was converted to a municipal gymnasium but closed again in the 1970s. Next, the building was used to house a transmission repair service. In 1994 the building was purchased by Eric Richmond with the intent to convert the structure into an office for a computer consulting business, commercial space for rent and possibly a location for a restaurant. Richmond turned Public Bath No. 7 into the Brooklyn Lyceum, a co-work and event space that hosts a range of of activities including classes, music events, film shoots, theater productions, weddings and more. New York city had a total of 25 public baths, seven of which were located in Brooklyn. 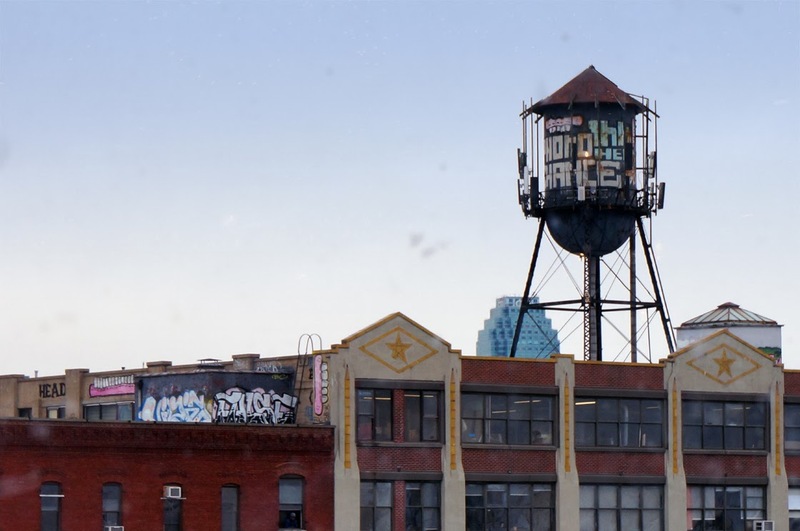 Below is a list that includes all of the Brooklyn public baths, as well as their fate from what I have been able to surmise by using information from various articles and by using Google Streetview. 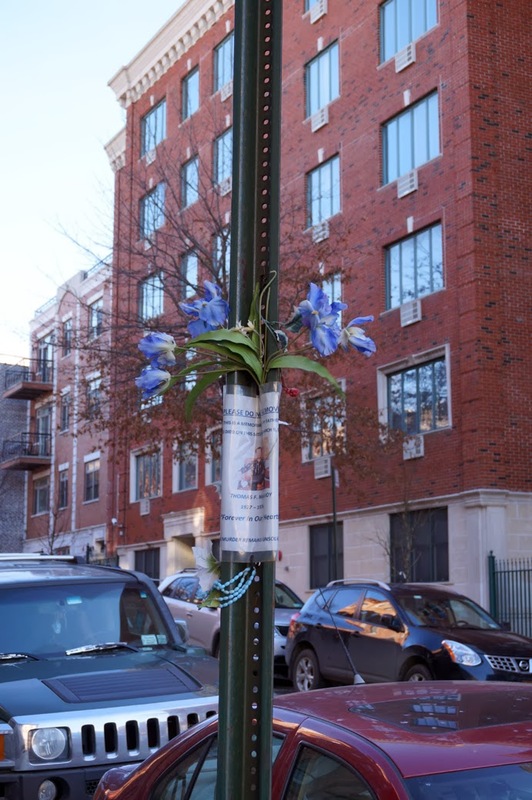 Adjacent to the Brooklyn Lyceum is a memorial to Thomas F. McAvoy, a homicide victim in one of New York's cold cases. During a snowstorm on March 9th 1976 Mr. McAvoy, a 49 year old father of 2, was shot in the head next to the Park Slope bathhouse. The police were never able to determine a motive and the weapon was never found. "Work Finished on Greenpoint Public Baths" Brooklyn Daily Eagle. 21 September, 1939. 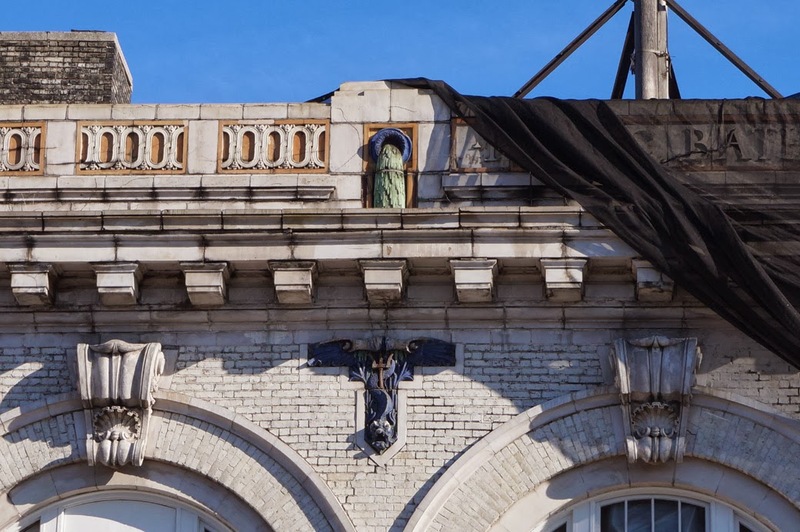 "Brooklyn Lyceum Slated for Auction" Brownstoner. Online. 5 February, 2013. Steinhauer, Jennifer "Old Bathhouse to Come Alive" New York Times 1994. Mitchell, Kerrie "The Coldest Case" New York Times. Online. 20 August, 2006. Designed by influential architect Henry Dudley, the Church of the Ascension was dedicated on September 16, 1866 and is one of only four remaining Dudley churches in New York City. 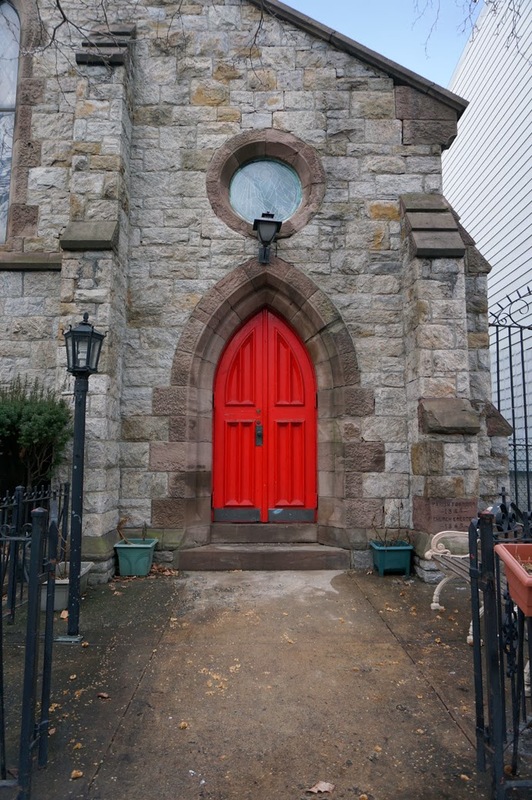 Dudley was one of the key figures responsible for bringing the Gothic Revival style of architecture to the U.S. Architecturally unique in appearance for Greenpoint, the church was designed in Early English Gothic style and resembles an English country church. The primary material used in the construction of the façade is Hunter’s Point granite which is laid in a random ashlar pattern. The other architectural features of the facade include “pointed-arch aisle entrances, Early English lancets and stepped buttresses”. The interior of the church is consistent with the country church appearance of the exterior. 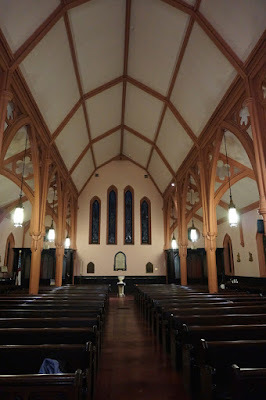 The pews, columns and decorative elements are made of wood and the building incorporates a restrained use of stained glass. 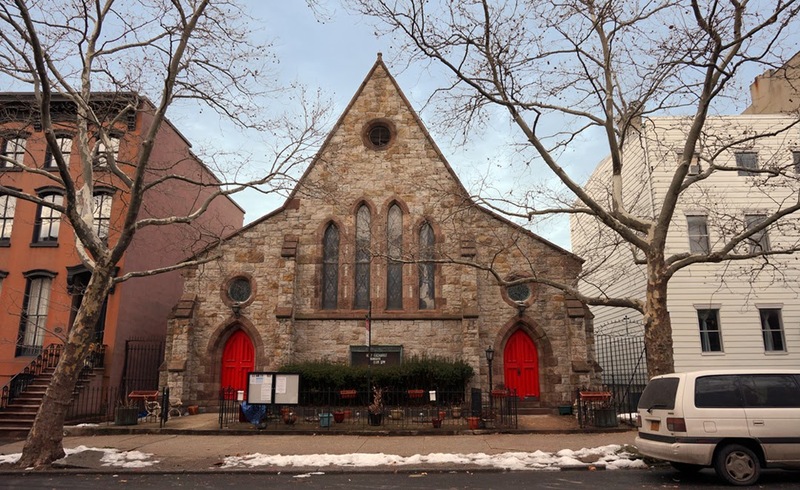 The Episcopalian church congregation of the Church of the Ascension was founded in 1846 and has served Greenpoint for 168 years. 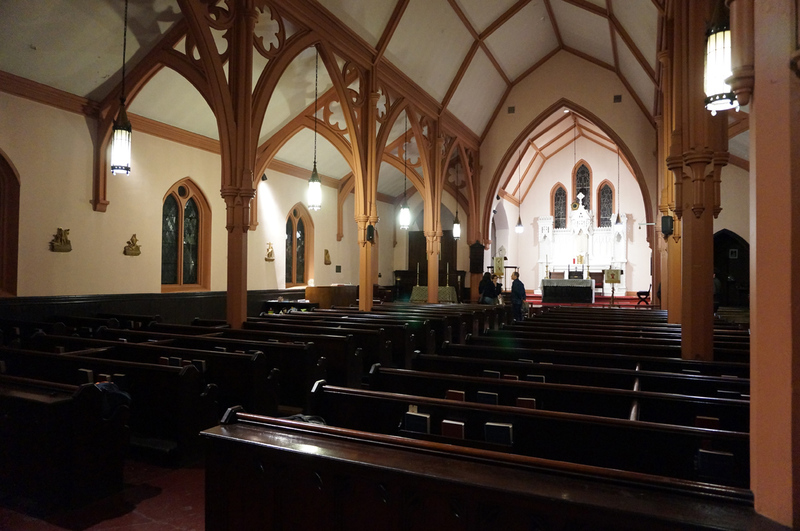 After Hurricane Sandy the church provided a logistical base in North Brooklyn for the Occupy Sandy relief effort. When I stopped by the church after the storm it was a beehive of activity with volunteers sorting donations of food, clothing and blankets, as well as preparing car-loads of supplies and volunteers to be taken to the Rockaways and other disaster areas. In addition to the disaster relief, the church operates a regular soup kitchen on Saturday for the neighborhood’s less fortunate. Henry Dudley (1813-1894) was born in southwest England and practiced architecture in Exeter prior to moving to the U.S. In addition to being one of the leading architects in the Gothic Revival movement in America, Henry Dudley was a founding member of the American Institute of Architects (AIA) and many of his structures are listed on the National Register of Historic Places. As an architect specializing in Gothic Revival architecture, Dudley designed many ecclesiastical structures including St. George’s Episcopal Church (Queens), Mary’s Episcopal Church (Staten Island) and St. James Episcopal Church (Bronx). Although Henry Dudley designed many churches in New York, he is most noted for his architecture in Nashville Tennessee, where Dudley along with his partner Frank Wills designed the Church of the Holy Trinity. The church is listed on the National Register of Historic Places. The American Institute of Architects. "History of the AIA" Online. Church of the Holy Trinity "Parish History" Online. 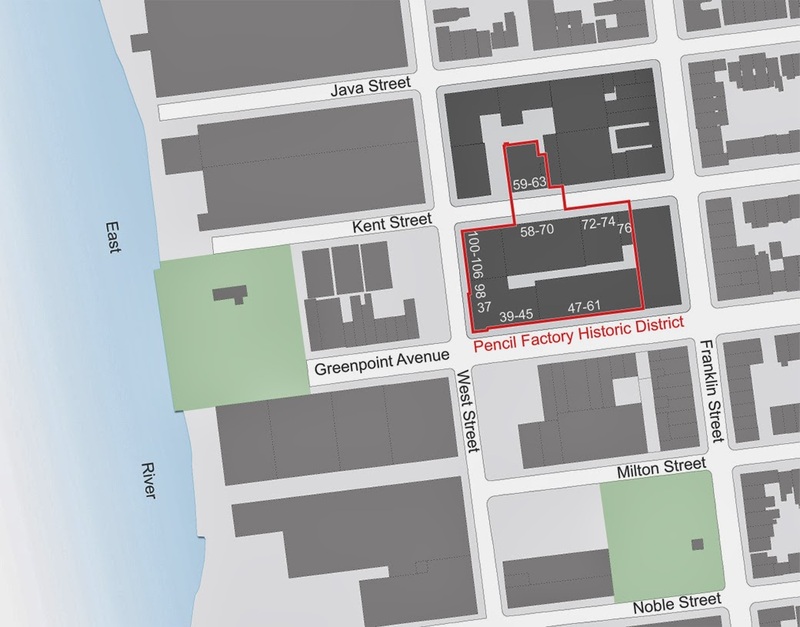 The Eberhard Faber Pencil Company owned nine buildings in Greenpoint between West Street and Franklin Avenue, comprising what is now the Eberhard Faber Pencil Company Historic District. Some of the buildings were existing structures purchased by Eberhard Faber while others were built to expand the companies manufacturing capacity. 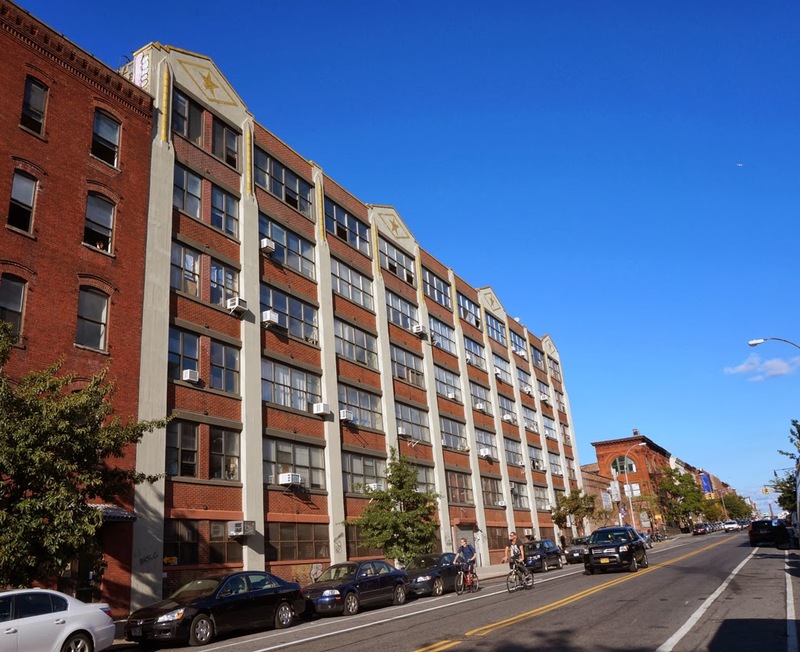 The district's nine buildings were constructed at different times and represent various architectural styles including Italianate, German Renaissance Revival, German Romanesque Revival, Neo-Grec and Art Deco. 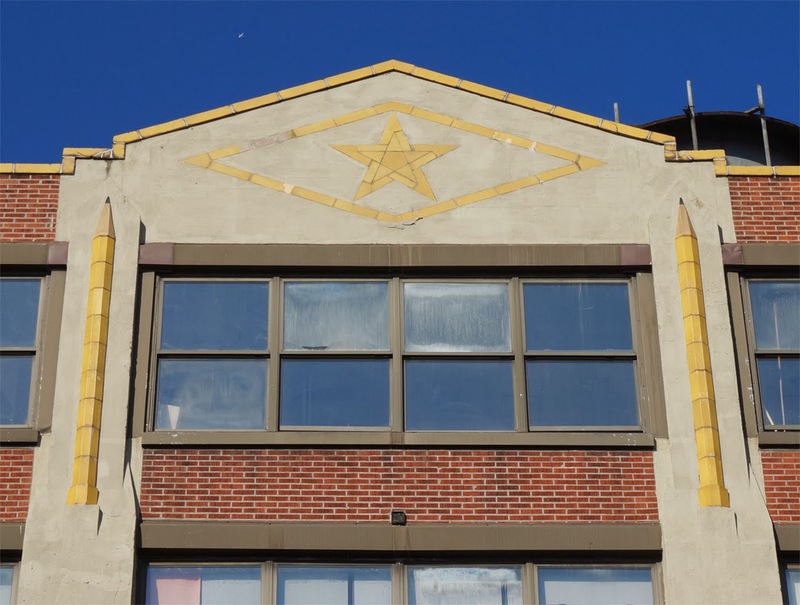 Many of the pencil factory buildings can be identified by the star insignia located on the building's window lintels and parapets. Founded in Stein Germany in the 1700s, the company began manufacturing pencils on 42nd Street in Manhattan before relocating their US operations to Greenpoint in 1872 when their Manhattan factory was destroyed by fire. The Eberhard Faber Pencil Company produced one of the "best known brands" of the ubiquitous #2 pencil and was the first to mass produce lead based pencils in the United States. The pencil company was responsible for many innovations in pencil manufacturing and marketing including the production of pencils with colored tips, merchandising pencils in sets and manufacturing pencils with bright colored polishes to the wood encasements. As one of the largest pencil manufacturers in the world, the Eberhard Faber Pencil Company employed hundreds of workers and had factories in the U.S., Canada, Germany and Argentina. The Eberhard Faber Pencil Company stopped manufacturing pencils at its Brooklyn location in 1956 when it moved its U.S. Operations to Pennsylvania. Today the Pencil Factory buildings have been repurposed to suit the neighborhood's changing demographics. 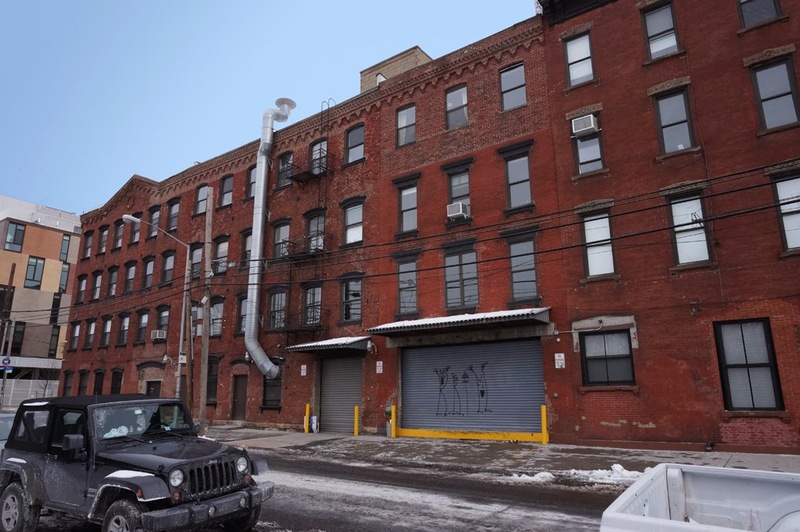 The buildings are now being used as apartments, commercial space, and artist studios. 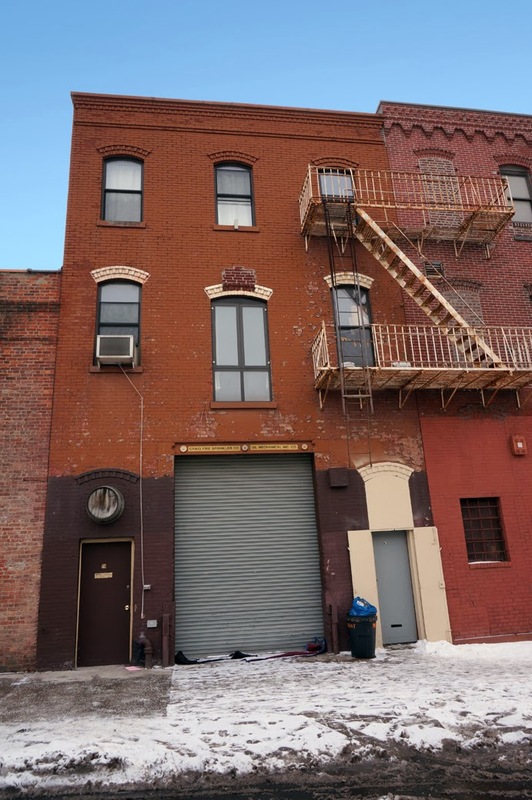 ﻿﻿﻿﻿﻿﻿﻿﻿﻿Another building purchased by the Eberhard Faber Pencil Company was the red brick Neo-Grec style building at 37 Greenpoint Avenue that was constructed in 1881. The building was constructed by S.A. Valentine to be a store and tenement but was instead occupied by the Fience Manufacturing Company. By the end of the 1880s the building was purchased by Faber to be used as office space for his company. 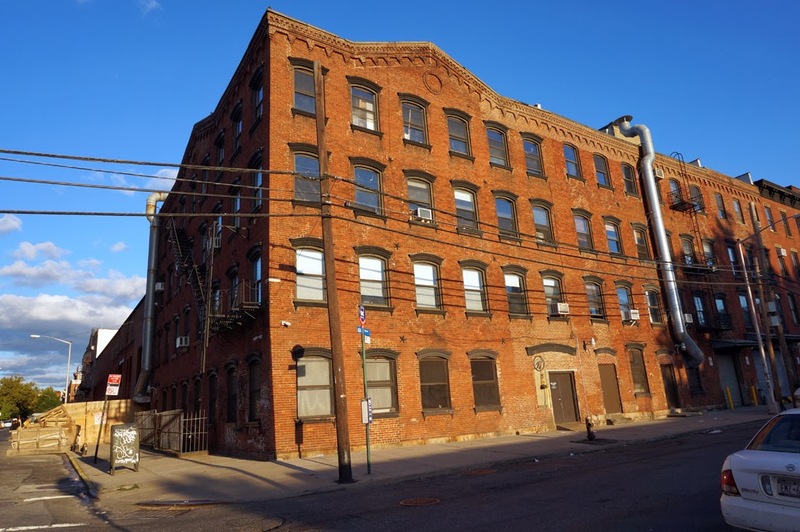 ﻿﻿﻿﻿Built sometime between 1886 to 1904, the brick structure at 76 Kent Street likely served as a stable and loft. It is unknown as to whether the structure was purchased or built by Faber; however the building features German Renaissance Revival style elements typical of some of the companies' other buildings. The structure was repurposed for residential use in 1980. ﻿﻿Three buildings existed in this aggregate of facades including one (originally 60-64 Kent Street) designed in the German Renaissance Revival style by Brooklyn architect Theobald Engelhardt circa 1895. The other two buildings were designed in the German Romanesque Revival style and the Italianate style. The facades of the two story buildings are all that remains of the original structure; behind the facades is new construction. The rehabilitation of these Pencil Factory building facades was recently completed with new corten steel liners being installed in the doors and windows. While not an original component of the structure, the oxidized corten steel is a respectful nod to the building's industrial past. The building is now Kickstarter's corporate headquarters. ﻿﻿Another German Renaissance Revival style structure, this building (above) was constructed circa 1904-1908. While the first story has been altered, the second story remains mostly intact. ﻿﻿﻿﻿Designed by architect F. Nelson, the building at 59-63 Kent Street was constructed around 1910-1911. Unified in appearance to the other buildings in the complex, the factory continues the use of German Renaissance Revival style detailing and has the star in diamond motif of the Eberhard Faber Pencil Company. 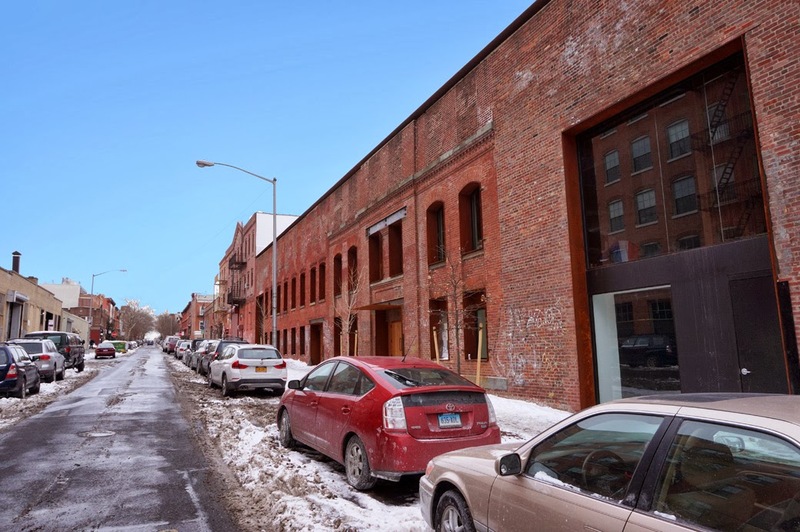 The building was once linked by sky bridge to the Pencil Factory building across the street at 58 Kent street. The six story Art Deco building embellished with terracotta pencils is the most prominent of the Eberhard Faber Pencil Company structures. 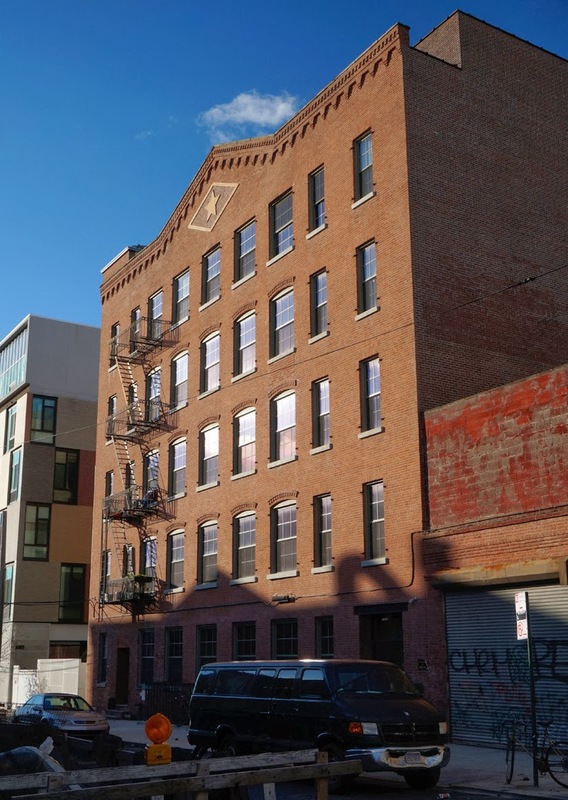 Designed by architect Frederick H. Klie and built in 1924, it was the last building in Greenpoint to be erected by the Eberhard Faber Pencil Company. The building was paid a visit by British Street artist Sweet Toof in 2010 and many of his teef can still be seen near the roof and on the cistern. The building now serves as studio space for artists, illustrators and designers. 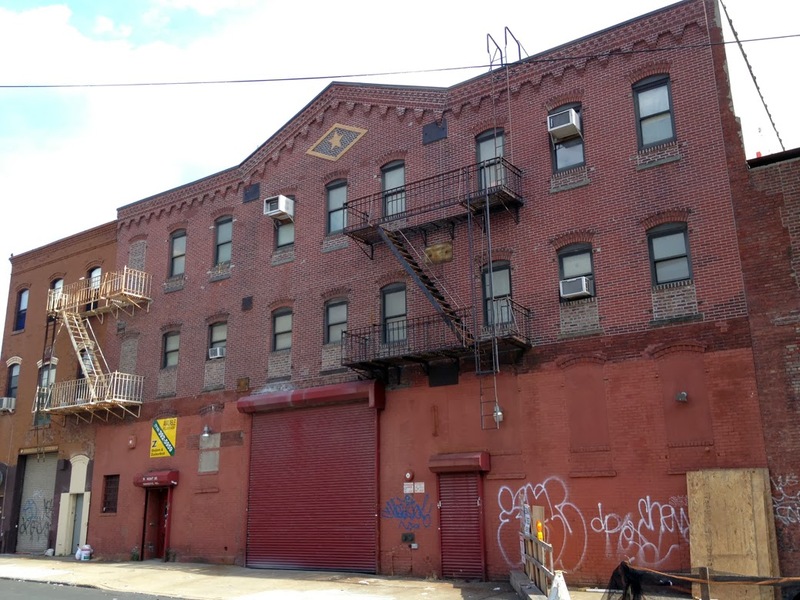 Dunlap, David "Pencil in Landmark Status for a Brooklyn Factory" New York Times Online. 23 July 2007. Walker, Rob "The Pencil Factory, an Oral History" Printmag.com 15 January 2013.